Latest Updates on Budget 2019 : Standard tax deduction for salaried persons raised from Rs. 40,000 to Rs. 50,000. Read here the key highlights of Interim Budget 2019. School, college, career, marriage… these are some of the common milestones of life. Similarly, paying your income tax for the first time is a milestone in any citizen’s life. However, the process can seem too daunting and tedious for a first-timer, and some of the terms tend to go right over your head. This needn’t be so. To help you understand the tax implications of your income (based on your income source), here is a compilation of basics of income tax for beginners. Income on which you pay Tax? TDS or Tax deducted at source? Are you just out of college and looking for a job? Or have you already landed the job and are going to file your income tax returns for the first time? If nitty-gritty of income tax and investments confuse you, ClearTax is here to help. Our aim at ClearTax is to simplify Income Taxes for you and make your financial lives easier. Basically, anybody with an income is liable to file income tax returns. Today we bring to you the basics of Income Tax you’ll need to equip yourself with and this should help you take a confident first step into your job. Previous year or the financial year or your tax year is the 12 month period that begins on 1st April and ends on the 31st March of the next year. No matter when you start your job, your tax year closes on 31st March and a new tax year starts on 1st April. So, it is important to plan your taxes for each financial year. It is a term you’ll often hear in relation to tax filing. It is the financial year after the previous year in which you will ‘assess’ and file your return for the previous year. So, assessment year is 2019-20 for the previous year 2018-19. Assessment year is the year in which you will file your return for the previous year. For instance – if you start your job on 1st January 2018, your tax year closes on 31st March 2018. 2017-18 is your previous year and your assessment year is 2018-19. You will be filing your return in the assessment year 2018-19, for which the last date will be 31st July 2018. When you start your job – reach out to your payroll or HR department and get your Salary details/ Pay Slip / Tax Statement. Here, you will get an idea of the major components of your salary and how much tax will be deducted from your salary based on them. Example: Most companies give House Rent Allowance or HRA, and you can save tax on that if you are living on rent. Besides the salary income you receive, you may be earning an income from several other sources. Your Total Income is the sum total of all heads of income below. Deductions reduce your Gross Income. These are the amounts Income Tax Department allows you to reduce your Income, bringing down your tax liability. The more you make use of the deductions allowed, the lower your tax shall be. 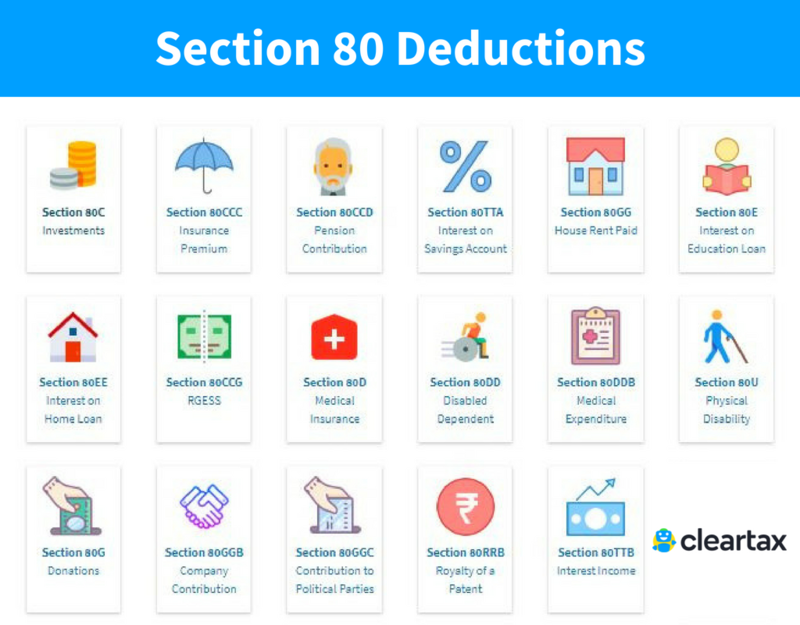 Deductions are allowed under section 80 of the Income Tax Act (Section 80C to 80U). Section 80C can take off INR 1,50,000 from your Gross Income. Given below are some of the widely-used investment vehicles under this section. One of the most popular deductions under 80C is deposits to Public Provident Fund or PPF. When you open a PPF account, you need to deposit a minimum of INR 500 and a maximum of INR 1,50,000 in a year. Money deposited in a PPF account compounds, as you deposit more money in the subsequent financial years to claim deductions. PPF is a traditional and safe saving avenue to park your hard earned money. A PPF account can be easily opened with a bank. Fixed deposits assure capital protection as well as a sizable interest income for investors. To get tax benefits under 80C, you need to stay invested for at least 5 years. It is safe, but the Interest Income from it is taxable. One of the only mutual fund scheme allowed under 80C, ELSS (Equity Linked Savings Scheme) is gaining popularity among people for its historically higher performance in the recent years. Another perk of ELSS is that it has the lowest lock-in period of 3 years. TDS is Tax Deducted at Source – it means that the tax is deducted by the person making payment. The payer has to deduct an amount of tax based on the rules prescribed by the income tax department. For instance, An employer will estimate the total annual income of an employee and deduct tax on his Income if his Taxable Income exceeds INR 2,50,000. Tax is deducted based on which tax slab you belong to each year. Similarly, if you earn interest from a Fixed Deposit, the bank also deducts TDS. Since the bank does not know your tax slabs, they usually deduct TDS @ 10%, unless you haven’t mentioned your PAN (in that case a 20% TDS may be deducted). On your Taxable Income, tax slabs or rates are applied and final tax payable is calculated. From this tax payable, you can reduce all the TDS that has already been deducted. You can always use our Tax Calculator! As per the Budget 2018, salaried employees are entitled to a standard deduction of Rs 40,000 from the gross salary. This standard deduction will replace the medical reimbursement amounting to INR 15,000 and transport allowance amounting to Rs. 19,200 in a financial year. 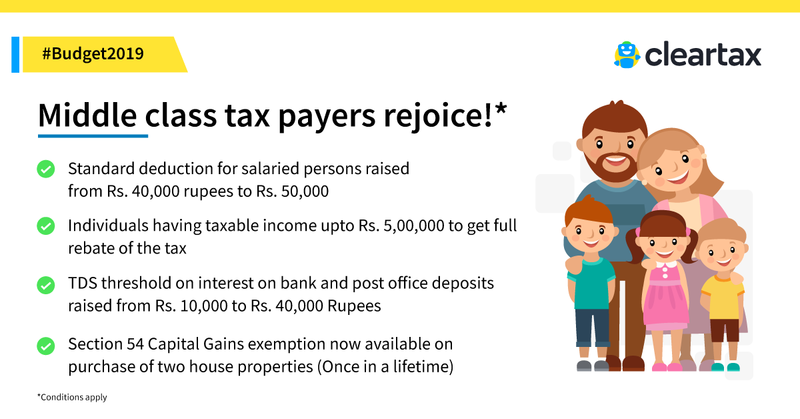 Effectively, the taxpayer will get an additional income exemption of Rs 5,800. The limit of Rs. 40,000 has been increased to Rs. 50,000 in the Interim Budget 2019.